Our list of the best things to eat and drink in L.A. this year includes a Oaxacan restaurant’s frozen pink wine, a burgeoning L.A. food legend’s impossibly creamy hummus, and a modern Italian restaurant’s devilishly delicious chocolate-on-chocolate cake. While it might seem heretical to skip a Dodger Dog when you’re in Chavez Ravine, do yourself a favor and head to the newish King’s Hawaiian Grill behind left field pavilion. The smoky pork nachos and saucy Big Island Lava chicken wings are a major up- grade on ballpark fare, and at $11, an order of pulled pork sliders with pineapple barbecue sauce might be the best deal in the (reliably pricey) stadium. Whether or not Kershaw gets the win, you’ll at least be ready to brave the parking lot traffic on a full stomach. Rosé has become the libation of choice for growing ranks of Angelenos, so it figures that bartenders found a way to convert the pink wine into a frozen cocktail. 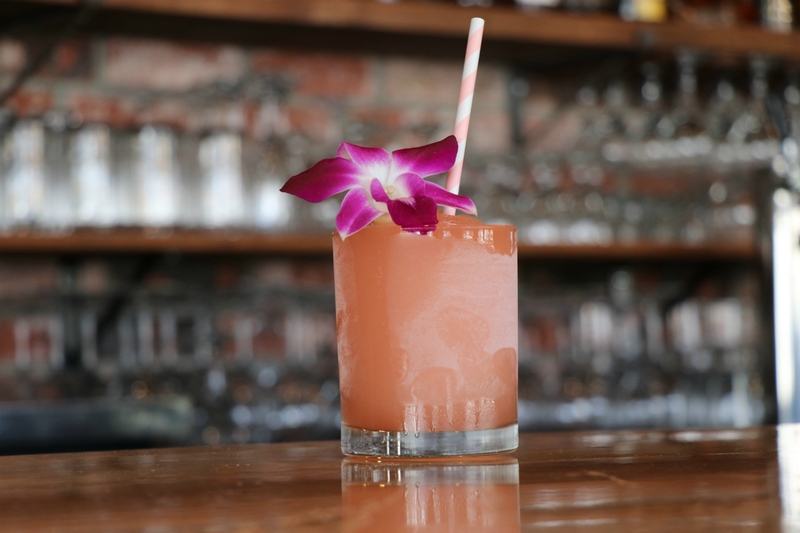 Though the slushy drink draws crowds at spots like Laurel Hardware and Thirsty Merchant, our fave is at Ivan Vasquez’s Oaxacan restaurant Madre, where the frosé is made from crisp Côtes de Provence rosé, crushed passion fruit and raspberry, grapefruit juice, and reposado tequila, which adds a boozy bass note. As a dish, shakshouka is deceptively simple: a robust Middle Eastern stew of tomatoes and bell peppers, fresh herbs, and a runny egg laid on top for good measure. When one recipe stands out over another—the cumin-rich take at Kismet, or République’s spin with kale and yogurt—the difference is in degrees. At Lodge Bread Company, the stellar shakshouka boasts brightness from fresh tomatoes and sprigs of dill, sure. But its secret weapon? Thick slices of fresh-baked wheat sourdough used to sop up every drop. Like the Warriors and Cavs duking it out in past NBA Finals, the battle for K-Town’s best barbecue always boils down to the same contenders. With exquisite banchan (side dishes) and thick slabs of pork belly, Park’s BBQ has long dominated the competition. But this year Gwang Yang—the U.S. branch of an upscale chain from Seoul—made its move. Marinated in sweet soy and garlic, its signature bulgogi is a profound experience, expertly charred table-side by servers, while super-marbled rib eye measures up against that of any steak house in town. And despite smoldering charcoal grills, a futuristic ventilation system means you won’t leave reeking of smoke. Long a champion of local produce, chef Jeremy Fox goes into full-on flex mode when it comes to his grain bowls at Rustic Canyon. A mixture of red Rancho Gordo quinoa, green farro, and fried sprouted rye acts as a hearty base, the latter lending an audible crunch. A community of vegetables comes mounded on top—depending on the day’s farm haul, that could be roasted cauliflower, shaved radish, pickled ramps, or edible flowers—and in the center is a vibrant spin on Green Goddess dressing made from avocado and garlic. The $18 price tag might induce shock, but it ain’t easy (or cheap) to make health food look and taste this good. Finding a dreamy slice of chocolate cake in L.A. is surprisingly difficult. While the Larder at Tavern in Brentwood might make our fave standby, Thessa’s Chocolate Cake at Jon & Vinny’s takes the crown. Pastry chef Thessa Diadem turns the classic Dutch dessert—served Friday, Saturday, and Sunday—into a chocolate-on-chocolate blackout. Three moist layers made with two types of cocoa powder are separated by dark, creamy fudge and chocolate buttercream frosting before being drizzled with vanilla crème anglaise (a play on melted ice cream). If this is indeed devil’s food, we’re happy living in sin. 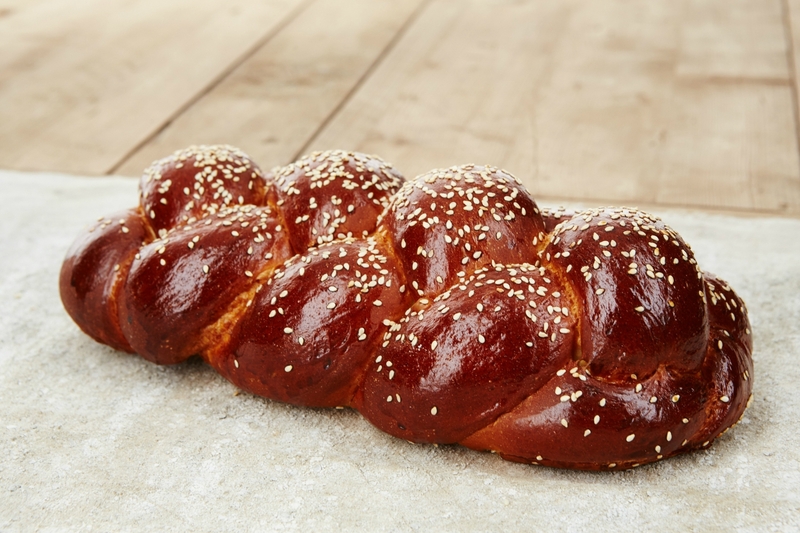 Done right, challah, that Rosh Hashanah favorite, is bulbous and braided like a tangled knot. It should be firm and shiny, made using olive oil (not butter), with a tender crumb that pulls away in strands. You’ll find creative versions (studded with green olives or dried fruit) at Jewish bakeries like Got Kosher?, but nothing rivals the l’chaim-worthy egg bread at Bread Lounge, where Ran Zimon, the Israeli immigrant who opened shop in 2012, hews to tradition: natural yeast, no mixes, and the perfect kiss of honeyed sweetness. As you flip past the sherry-laced classics and spicy mezcal numbers in the leather-bound drink menu at the Nomad Hotel, there’s a section that bar director Leo Robitschek has dubbed “Soft Cocktails,” a list of non-alcoholic sippers that deliver excitement on par with their intoxicant siblings. The Ocha, a gin-less play on the bar’s Sakura Maru cocktail, blends roasted green tea with sheep’s milk yogurt. The Peter Piper, made with pineapple juice, lime, black pepper, and white balsamic, hits notes similar to the tequila-spiked El Rey, so it doesn’t feel like you’re missing out on the show. Shirley Temples these are not. On the ground floor of the revamped Beverly Center, Michael Mina’s striking trattoria Cal Mare blasts away any lingering prejudice about eating out at the mall. The open kitchen is focused on Italian seafood, a theme driven home by the dining room’s bedazzling fish-scale tiles. The cooking is equally dramatic: roasted, grilled, and salt-baked fish, billed as “Jewels of the Sea,” and silky handmade pastas like egg yolk bucatini with oxtail, melted onion, and wisps of Parmesan. We’ve come a long way from Cinnabon, baby. The flat white, Australia’s signature coffee drink, has been a local hit since it first began cropping up at Aussie-style cafés several years ago. Almost any coffee shop worth its beans will make one for you these days, but the finest rendition is at Sydney import Paramount Coffee Project. Roughly cappuccino-size, with a few ounces of steamed milk and a thin layer of microfoam, it’s smooth as a milkshake but with a sturdy smack of espresso. You might never order another latte again. 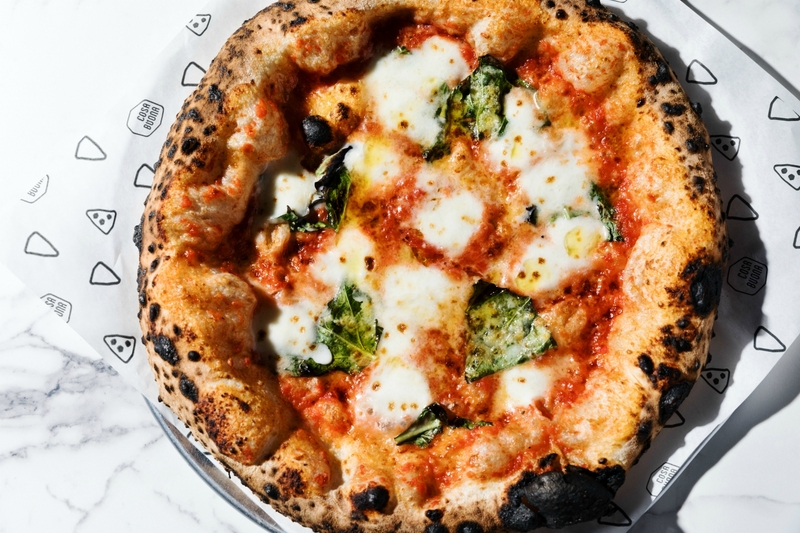 Every time Zach Pollack slides a classic margherita into the wood-fired oven at his Echo Park pizzeria, Cosa Buona, a hundred tiny details snap into place. The fermented crust puffs until it reaches a happy ratio of speckled char to doughy goodness. The bubbling tomato sauce, made from canned organic California-grown plum tomatoes, balances sweetness with subtle acidity. The fresh basil is bright and aromatic, and the molten cheese (fresh mozzarella and Parmesan) oozes just enough. If you were impressed with Pollack’s pies when he was at Sotto, wait until you taste his handiwork now. Like a fine nebbiolo, this pizzaiolo’s skills have only gotten better with time. When it comes to unfussy garlic bread, few candidates can hold a candle to red-boothed heavyweight Dan Tana’s, the storied 54-year-old celeb haunt situated in a yellow cottage on the edge of WeHo. With classic red sauce joint panache, the kitchen lavishes slices of crusty Italian bread with glugs of olive oil and pungent chopped garlic cloves, then covers them with a handful of shredded mozzarella that it broils to melted excellence. If you’re not starting every meal at Tana’s with a napkin-covered basket, you’re doing it wrong. Those who frequented Charles Olalia’s tiny DTLA lunch counter, Rice Bar, knew big things were in store when the former Patina chef took over Silver Lake’s erstwhile Bar Angeles space and transformed it into the lush tropical hangout Ma’am Sir. The Manila native refines Pinoy classics like sizzling pork sisig and adobo fried rice without dampening the cuisine’s rustic spirit. Crunchy cigar-length egg rolls called lumpia arrive draped with sea urchin, and there’s a fragrant pandan-leaf-infused old-fashioned. Who could ask for more? With splashy newcomers like Pacific Seas downtown and Lono in Hollywood, L.A. might be experiencing a tiki bar resurgence. It’s the city’s oldest, though, that still rules them all. Purists often debate what matters more at a tiki bar— amazing ambiance or quality cocktails—but North Hollywood’s Tonga Hut, established in 1958, pulls off both. Tiki statues and wood carvings flank the low-lit, mid-century-style space, where you can canoodle in wood-canopied booths or lounge around a vintage fireplace. At the bar, classic mai tais mingle with seasonal spins like the Lavender-Mint Sour and house specialties like the ginger-spicy Bermuda Dunes. The cognac-spiked Scorpion Bowl is as smooth as it is dangerous, a must for any reputable tiki joint. Highland Park Brewery, Brouwerij West in San Pedro, Three Weavers in Inglewood—they’re fine brewery taprooms, what with their easygoing vibes and broad selection of interesting beers. Progress Brewing does them one better, though. A welcoming oasis of IPAs in yonder South El Monte, it features 28 house brews on tap (anything from buckwheat saison to blood orange sour) and serious entertainment options like flat-screen TVs, a digital jukebox, and retro arcade games. Hungry? Partner that pilsner with grub from Tacos La Bomba, a regular at the dedicated pop-up station. In parts of the South, boiled peanuts are as ubiquitous as moss-draped oaks and Confederate flag bikinis. Here, not so much. But at Crawfords in Westlake, a neighborhood dive where the decor is more or less “grandpa’s basement,” a heaping cup of the legumes (served from a simmering Crock-Pot behind the bar) will convince you that you’ve been missing out. Soft, salty, and spicy as hell, they’re $3 and madly addictive. Just try not to burn your fingertips as you hastily pop them out of their shells and into your mouth. Even if you visit Papa Cristo’s solo, the beloved restaurant’s Thursday night Big Fat Greek dinners are enough to make you feel like family. Held at long communal tables, the meal begins with tzatziki and dolmas laid out for grazing, accompanied by tastes of Greek wine. Dinner (a steal at $24 per person) lives up to its moniker: salad and soup, roasted potatoes, stewed green beans, lemony chicken, and tender grilled lamb chops. The Pico- Union restaurant’s belly-dancing show is a hoot, but the highlight comes when owner Chrys Chrys—a squat, adorable man with a push-broom mustache—holds court in the dining room. 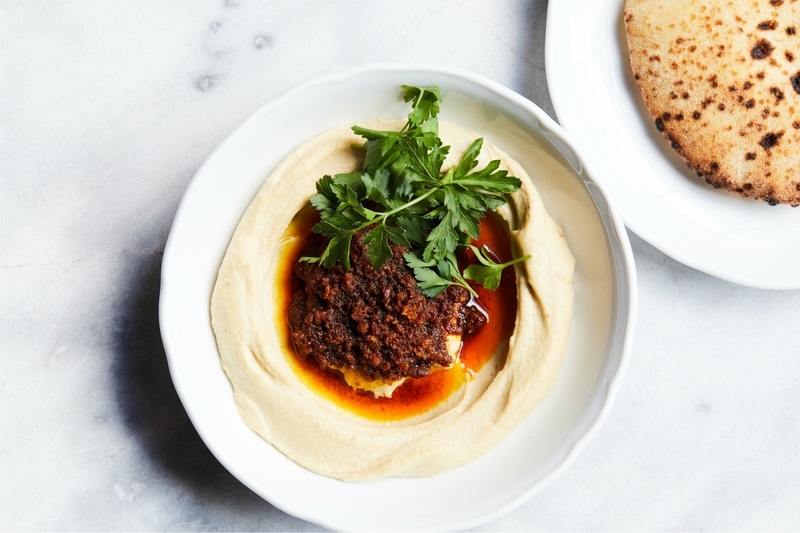 When you hear that Bavel chef Ori Menashe tested his hummus recipe roughly 400 times before serving it to diners, you might think life is too short for such obsession. But then you taste the silky chickpea spread at his new Middle Eastern restaurant, and you’re overcome by a sudden wave of gratitude—blessed be the obsessives. There are typically a few styles to choose from, all scooped up with warm, soft-as-cotton pita. The duck ’nduja hummus, enhanced with parsley and a pool of spicy chorizo-esque meat, is transcendent, but it’s the simpler kind, drizzled with olive oil and dotted with chile paste, that stole our hummus-loving heart. Wielding long, thin yanagiba knives, the chefs at Aburiya Raku are masters at assembling gorgeous bouquets of raw fish. Order the moriawase platter for a gleaming assortment of the day’s catch—anything from fatty tuna to baby barracuda—or opt for an entire fish, like aji, filleted and sliced to order. After you’ve finished the last bite of sashimi dabbed with plum-infused shoyu and topped with a hit of fresh wasabi, the bones are whisked back to the kitchen and deep-fried for a crunchy finale. A fixture at hotel lounges and golf courses, the traditional triple-decker-with-a-frilly-toothpick club is a for- mula not to be messed with. 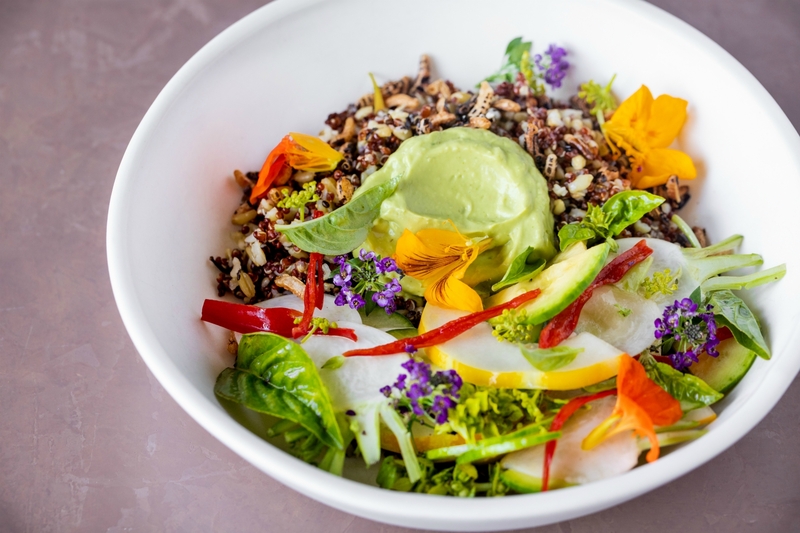 If you’re feeling splashy, there’s the $38 classic bacon-avocado situation served poolside at the Beverly Hills Hotel or the $28 interpretation with a fried egg from Wolfgang Puck at the Hotel Bel-Air. But it’s the $9 workaday club at beloved midcentury diner Rae’s that nails the perfect ratio: toasted sourdough, a generous spread of mayo, crisp iceberg, tomato, bacon, thick-sliced turkey, and a welcome layer of American cheese. Next time your bar mates drag you for ordering such a seemingly basic drink as a G&T, take them to Bar Figueroa. The Hotel Figueroa’s watering hole offers a gin tónica menu designed by barman Dushan Zaric, whose travels through Spain inspired his six concoctions. Each is a marvel in its own right, but dip your toe in with the Old Harbor, flavored with cucumber, cilantro flowers, key lime, juniper berries, star anise, and Three Cents Aegean Tonic. Extra points for the “freeze-infusing” of the goblet-size cocktail with liquid nitrogen, which makes this quaff as Instagrammable as it is delicious. For those lucky enough to visit the Ugly Drum booth at downtown’s Smorgasburg food market on any given Sunday, life can be separated into two parts: before pastrami enlightenment and after. Pit-smoked for 12 hours and piled between soft slices of Bub & Grandma’s bread, Mozza veteran Erik Black’s spice-rubbed brisket is as good as it gets. Fatty and juicy and mouthwatering, it hearkens to Central Texas ’cue as much as it does to the estimable Langer’s version. Not only is this the finest thick-cut pastrami in L.A., it could well be the best in the country. 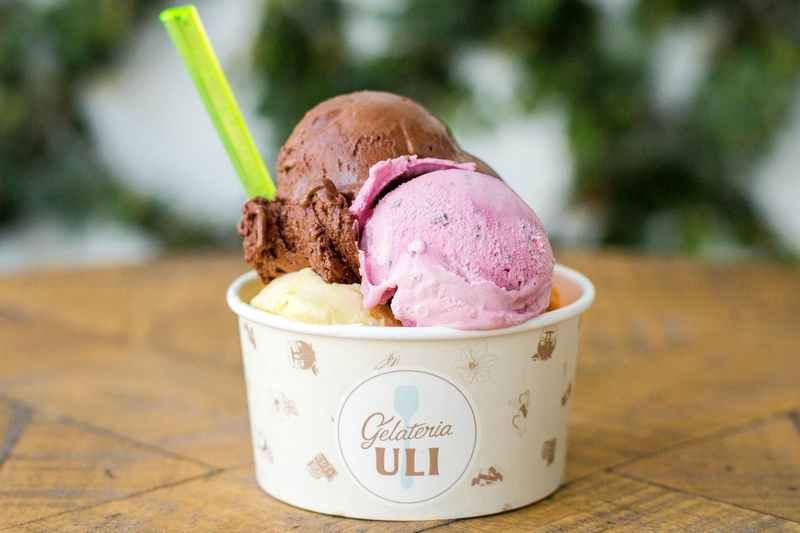 In a city where frozen scoops are big business, four-year-old Gelateria Uli stands out by offering legit Italian gelato that still manages to taste like Los Angeles. Owner Uli Nasibova, a transplant from Azerbaijan, fills a freezer case with flavors that hop enthusiastically between cultures, like creamy horchata arranged next to black sesame and ube (purple yam). The pistachio is one of a kind: Rather than glow-in-the-dark green, it’s made from California-grown nuts that lend a pale green hue and a toasted richness along with that smooth, soft, elastic texture that separates true gelato from its icy imitators. There was more than a little heartache when Santa Monica’s Punta Cabras closed last year. After all, the place was beloved for a tostada that packed a wallop of flavor without a smidgen of animal. But now it’s back in a larger space with a 1970s Baja theme and a vibe that’s livelier than ever. The city’s finest vegan tostada is back, too, and just as delicious. Piled with shaved pickled cauliflower—a clever textural riff that combines the zip of ceviche with raw-veggie crunch—it’s enhanced with mashed avocado and spicy cashew crema spread onto a crackling fried tortilla. A quality croissant, fortified with obscene amounts of butter if done correctly, is an easy thing to love. Petit Trois in Sherman Oaks makes a fine specimen that’s crisp on the outside with a rich center that borders on doughiness. 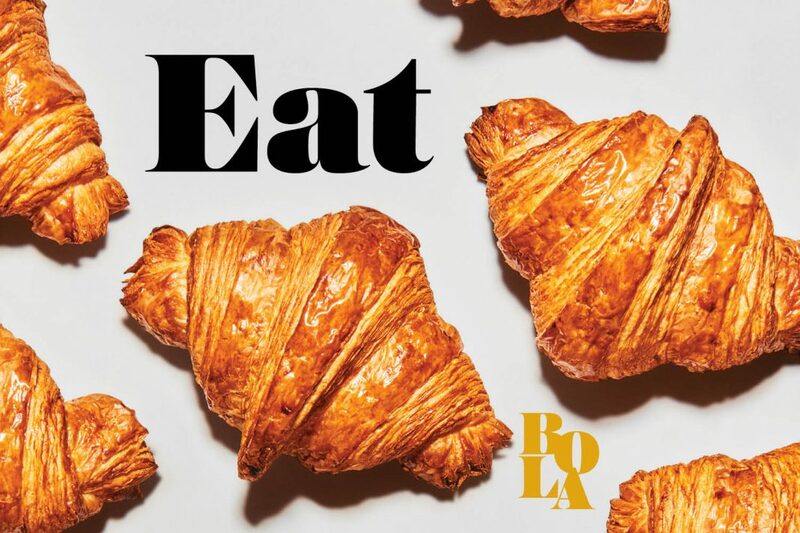 But the croissant that won us over is from Proof Bakery, local pastry legend Na Young Ma’s eight-year-old Atwater Village bakery best known for exquisitely flaky delights made with organic flour. Beyond the traditional, you’ll find ones filled with chocolate, almond paste, ham and Gruyère, or pistachio-raspberry jam—all of them worth waking up way too early for. 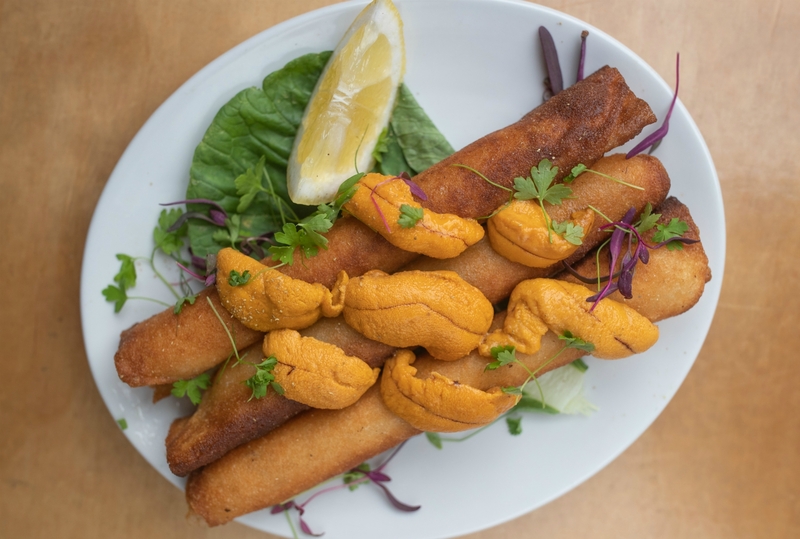 Parked at San Buenaventura State Beach on weekends, Ventura’s Jolly Oyster is a mandatory pit stop for every bivalve fan traveling along the 101. The tiny blue trailer has been selling Baja-raised Kumamoto and Pacific oysters since 2011, catering to picnickers looking to shuck, slurp, and grill pristine shellfish steps from the sand. If you’re not handy with an oyster knife, there’s also a food truck serving scallop ceviche and fried-oyster tacos. Coastal dining doesn’t get much better.